It’s no good to be mad at myself for not being able to perceive the solution earlier, especially since it’s a no-brainer. But it’s all in the timing, as they say. I needed to learn some key concepts first. I needed to know how crucial the energy of JOY is and how pervasively JOY operates. This JOY concept is rather alien to me, given that I’ve had my share of misfortune. I thought I had many reasons to wallow in dark’s anonymity. As if martyrdom was a virtue, I fully participated in my depression. If I allowed myself to feel true joy, wouldn’t it diminish the seriousness of my suffering? I now allow myself a small chuckle at the memory. I was taking myself much too seriously. It’s great to be at the point where I can finally laugh. It’s funny to me now, remembering myself as the misunderstood, deeply feeling artist working from the depths of despair. Who could have guessed the seeds of (my) art grows faster when JOY is present? The answer is so obvious, its hidden. But still, I’ve ever so slowly been rising up, like a mist, from gloomy subterranean chambers into a lively expanse of light above. Today, I can appreciate the value of creating JOY. I LOVE that my early RPG illustrations of women provided lasting memories for so many. That’s why, in recent years, I’ve lent the bulk of my energy towards creating art for classic RPGs—in hopes of building positive memories for the next generation of gamers. Contributing to the feel-good memories associated with game play is a very worthy goal. My newest dawning realization came when I proudly showed off my Coloring Book at a Feminine Empowerment Weekend. The response was so overwhelmingly positive, I’m expanding my market to include a demographic that has been as dispossessed and as invisible as I’ve been. My new demographic is women seeking feminine empowerment. Yet, I want to offer more than an awesome coloring book with archetypal images of powerful women. I received so many comments about women’s love of mermaids, it got me to thinking. If a lady identifies with being a mermaid so much, why not create a painting of her AS a mermaid? What if I create fantasy portraits for women who wish to sustain the awesome shifts they’ve already achieved? Would women welcome seeing their innate genius and strength of spirit expressed through fantasy imagery? I hope so. Many ideas occur to me. I could create portraits of women alongside their power animals, or as cat woman, or as an Egyptian goddess or queen or character, the possibilities are only limited by the imagination. Whatever their fancy may be, my portrait paintings will remind women of how unique and special they are—like beautiful, magical beings of light who have much to offer the world. The thought of uplifting their self-image through my art brings JOY to my heart and feeds my Soul. I realize that this slight change in focus—from a fantasy artist to a fantasy portrait artist—has been staring at me in the face for a while. Haven’t a clue why I could not perceive the clarity of making this shift before now. But I won’t continue to admonish myself. It’s all in the timing. That’s my out. My new, and entirely unique creative endeavor feels good, appropriate, and totally right. I’m not saying that I will not also consider painting portraits of RPGers as their favorite character (think cos play)—of course, that’s always a possibility—but I’ll be directing my main focus as stated. Thank you for witnessing the birth of my new creative endeavor. 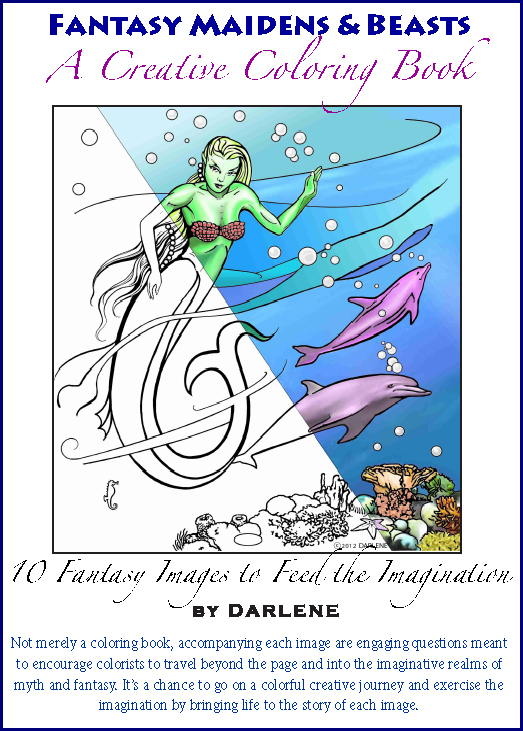 This entry was posted in Life As Art, Recent Events, The Creative Process and tagged fantasy, fantasy art, fantasy portraits, Feminine Empowerment, JOY, mermaid, portrait, positive memories, Power of Joy, women on May 10, 2017 by Darlene.